The simple answer is very carefully. Although Yvonne appears to be tackling the future with reckless abandon, that is far, far from the truth. 1. Everybody calls on customers. If you are not busy tending to customers, you are on the telephone calling on customers. Today, that includes text messages and email. 2. Think. Ask your customers in what ways and how often might you communicate with them. ...once a month? ...whenever there is a special? ...whenever you have something specially for me? Whenever you have something specially for a person whom I love? If you are attenuating to your customer's deepest needs, wants and desires, you cannot communicate too often! Very carefully. A key is to reinvest your profits. If Yvonne had spent all of her profits, she would still be selling jeans. Expansion and change occurs only when you have cash to invest -- and most often the best cash is that earned from a profitable business. You think back: Did Yvonne mention anything about having a banker or an investor? Answer: No. She simply said she had to use her profits to grow the business. If you don't have financial help, you can't take cash out of the business for a fancy personal lifestyle until you achieve your business goals. The money you leave in must be invested in new product development, hiring great people, or marketing the business to drive up sales. Most small business owners are conservative or have learned to be the hard way. Bankers only loan money to you if you don't really need it and investors aren't too motivated to put money into a company run by a person who has no fiscal discipline. What do you think? Why are retained earnings the best type of cash for growing your business and what is the down side to only depending on profits to finance growth? Answer: If you only use your own profits, you have no interest to pay to the banker and you don't have to give up any ownership to an investor. However, if profits are hard to come by, then your growth will be very slow. There's much more here about all types of financing. Go to these episodes of the show: We'll Show You The Money, When The Banker Says, "No," and SCOR. Yes. In retailing, plan to work Saturdays for the rest of your life. This is Yvonne's secret for staying close to the customer. In Tom Peter's book, In Search of Excellence, he noted that the best companies are the ones who listen to their customers' suggestions and then take action. Yvonne knows that if she is to understand her customer thoroughly, she must see them on Saturdays. This is no sacrifice because she loves being in her store and delighting her customers. What do you think? Would you be willing to work every Saturday if it enabled you to realize your life's dream? How do you want to use your time? What kind of environments stimulate you to be creative and energetic? Possible Answers: For those just starting, your answers to these questions will help you decide the kind of work you like and whether you would ever want to own your own business. Write it down. That should be the focus of your business. First of all, running a business is so consuming and so difficult, that if you don't really love it, you will quit. 1. It will get tough, then even tougher. Paula Quenemoen said your business will test you at every turn. She speaks from deep experience. 2. You need a deep connection with your work. When you love your work, you are energized by it not worn out by it. Marc Katz said, "Corned beef. It's my life, it's my lust." 3. That love is the beginning of insights for innovation. When you follow your dream, you will probably do something for the world that no one else can do as well as you do it. Think of Thomas Keller's cooking and the fact that his reservationist said, "When food passes through Chef Keller's hands, it is transformed." Also, Greg Bombard, owner of Catalina Express loves the ocean and can't imagine working anywhere but on the water. Retailing is particularly relentless. If you post your hours of operation, you or someone must be there. In other kinds of businesses, voice mail can put you in touch with your customers without actually being in an office. Yvonne said, "The world shops on Saturdays." If you think that you can be successful starting a business from scratch and not being present when most customers are present, you are suffering from delusions. A true shop keeper loves Saturdays and is excited by the idea that her place of business will be full of customers. It's almost like having a party every week. At Yvonne's shop you find refreshments in a lovely bar area which is a great place for men to have a cup of coffee, a beer or a cocktail while the women shop. Why do so many business owners advise not to worry about the money and to simply focus on your dream or what you love? HATTIE: You can probably tell we're in New Orleans. We've come to a one-of-a-kind city to find a one-of-a-kind business. Where can you buy gold-plated anything, drink hurricanes and listen to jazz within a three-block radius? What makes New Orleans New Orleans? The French Quarter, St. Charles Avenue and Yvonne LaFleur. I've worn her clothes for years. I sleep in her nightshirt, I conduct business in her suits and I go to formal events in her eveningwear. I don't just buy clothing from Yvonne, I buy an experience. We customers are ushered gracefully through rows of luscious fabrics and, while sipping a tall glass of iced tea, we try on what Yvonne thinks will make women look like women. When she was four years old, Yvonne LaFleur decided to be a merchant, and 18 years later, she opened her first shop. She started with blue jeans and now has one of the most exclusive shops in the South. 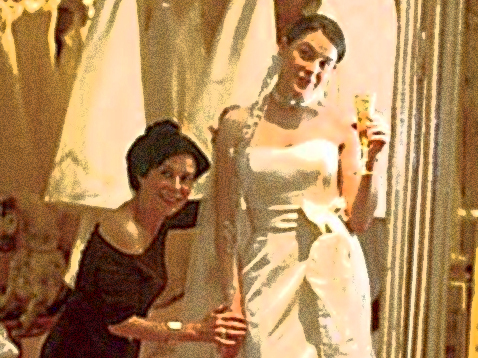 Brides come from hundreds of miles away to be properly attired by Yvonne. YVONNE LaFLEUR: And I would suggest she starts with white or ivory for the first night, then moves to black for the second night and then red the third night, all getting very small as we go along in size, the pieces, and by the fourth night, bring him into reality. Wear your T-shirt. HATTIE: Now I want to know if you wear these things that you sell. YVONNE: Absolutely. How do you think I got seven children? HATTIE: (Voiceover) In fact, it's been said this must have been the store Rhett took Scarlett to when they went to New Orleans to shop. In the early days, Yvonne would arrive two hours early to do all of the alterations. She designed much of the clothing and lingerie she sells. YVONNE: And there's everything in there from lingerie to linen suits to silk dresses. HATTIE: (Voiceover) She now creates custom hats for customers and filmmakers. This is no ordinary shopkeeper. YVONNE: And American women tend to wear the trim in the front. See how outrageous? And European women wear the trim in the back. HATTIE: (Voiceover) Today she has just under 50 employees and admits to constantly looking for the right people to work with her to build the business. Her staff doesn't wait for customers to come in. They call them. The future is full of fragrance and telemarketing, shipping and 800 numbers. Yvonne simply doesn't stand still. OK, Yvonne, you have just under 50 employees, seven children, you don't drive a car, your husband commutes to New York. How do you get everything done? YVONNE: I like to get up, really, around four and kind of get my day started because I have a great husband who is a partner with the children. HATTIE: If a young person came to you right now for advice, what kind of advice would you give them? YVONNE: I rather followed my dreams. It was something I always wanted to do. I think the true gift of life, of God, is knowing what you want to do at a very early age, and when I was four years old, I really became in love with retail. I think you have to be willing to do it all. And also, for a female to do a business, you almost have to put the family on the back burner, to start. When I started my business, I only had $10,000, and I knew that I couldn't do anything fabulous with $10,000, but I knew if I stuck with it, I could build it. And my motto, in the back of my head, was to think best and be best. When you're doing something, really, the importance of doing anything is to be focused, to get from A to Z. So all these little paths you kind of seek other interests in, they really take your energy away from the focus of developing your business. And at times, I opened other stores, and I had a factory business in New York where I sold about 400 stores throughout the United States, which was something I really wanted to do. But that--all those little activities really took away from this. And having seven children has taken a lot of time, but yet, I wouldn't do it any other way because it's added so much richness to my life. In building a business, you have to think that the money you're earning is really the business' money. It's its operating capital, and the more you can invest back into it, the sounder you will make it. If you're going to be in retail, you need to work every Saturday of your life because the world shops on Saturday. HATTIE: Here's what I learned from Yvonne LaFleur: Follow your dreams, reinvest your profits and, in retail, even when you're rich and famous, you work Saturdays for the rest of your life. YVONNE: So I'm still following my dream. "Never question the truth of what you fail to understand, for the world is filled with wonders."